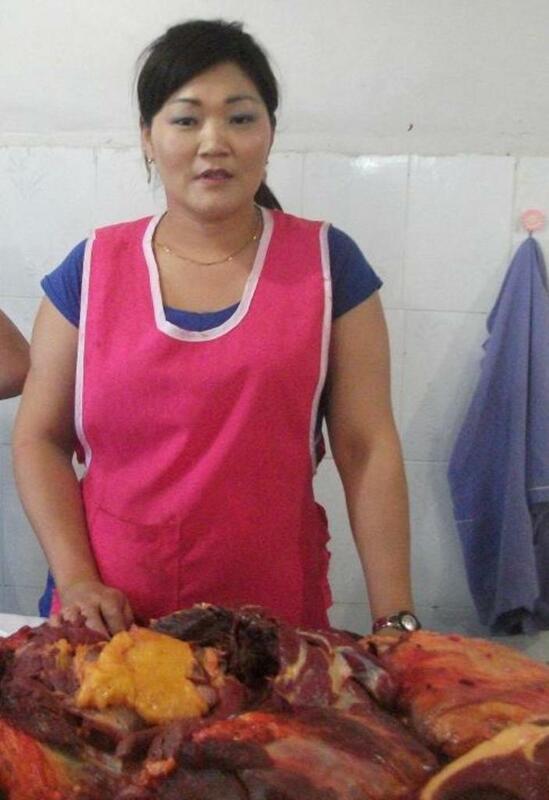 A loan of $2,450 helped to pay her son's tuition fee and buy more meat for her business. Altantsetseg is 41 years old and lives with her three children and husband in a private house in a Govisumber province of Mongolia. Her first son is a college sophomore at the Labor University and two other sons are high school students. Her husband was an assistant driver in rural transportation and became a driver in April 2011. Currently, he is fixing his broken car and soon will go for the domestic transportation. If he starts working, his monthly salary will be between 500,000 MNT and 800,000 MNT. Altantsetseg started her business by selling lunches and dinners at the local train station from 1996 to 2004. Then, with the profits she earned, she started to sell meat at the Baldanzasag market. She sells 2 or 3 goat or sheep meats on a daily basis. She never changed her sales location and has made many regular clients and sales channels. She is very experienced in her field. Altantsetseg became a driver in 2009 after completing the driver's training course. Now she saves her business profits to her savings bank account at Xas bank. She is a loyal customer of Xas bank. She is requesting a 3,000,000 MNT loan to pay her son's tuition fee and to buy more meat to increase her sales turnover.